Travel . : Sequins and Sand Resort Wear :. We're off on a Cruise for the first time. What do we pack? Jan.
Off to Fiji and Don't Know What to Pack? These day by day looks will keep your suitcase happy. We are going to Fiji for a family break and really want to make the most of it. What should we do? Sally. Sue asks: Tahiti, Fiji, the Maldives...they all look the same in the brochures. Are they really that different? Tahiti, Maldives, Fiji. What's the Difference? This summer, our mission is to get more women feeling fabulous about themselves in a cossie. Read more about our CossieConfidence mission and how to get involved. Glad I packed my: Cool white linen shirt and red lippie! Best place to eat: Psistaria Pandelis for its delicious array of yummy seafood! I went to: Paris & stayed in St Germain. Best Thing I Did: The kids' Paris Muse Clues treasure hunt at the Louvre with my Granddaughter. It was amazing! Glad I Packed My: Scarf to wrap around my neck for airconditioned spaces and cooler days. Best Place to Eat: I wish I could remember the name of the place but it was casual and very close to where we were staying. It served the best Snails in garlic sauce, each in its own little iron pot. Best Thing I Did: Snorkelled with the Manta Rays … WOW! Glad I Packed My:Sarong! It took no space in my luggage and the locals taught me so many different ways to wear it that I literally lived in it for the whole week! Best Place to Eat: Anywhere as long as you order the freshly caught fish of the day! The Poisson Cru raw fish dish is so good that I’m sure it will even win over non-fish lovers! Aaah, Tahiti. We're sure it should be spelt Taaaahiti in honour of the way it makes you feel and the images it immediately has us dreaming off to. Tahiti is actually a group of islands and an island itself. Confused? We were too until the Emma from Tahiti Mana explained. There are actually 118 islands grouped into 5 archipelagos that make up the Tahiti islands. Huge! Then, there is the island of Tahiti itself. 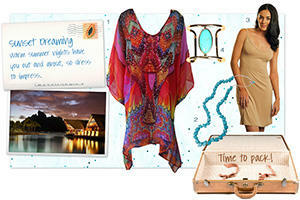 Island escapes and warm summer night have you out and about, so dress to impress. Kaftan, necklace, slip dress and cuff. Ole! Hop on a plane and getaway from the cold. Warm beach filled days ahead. Hooray!